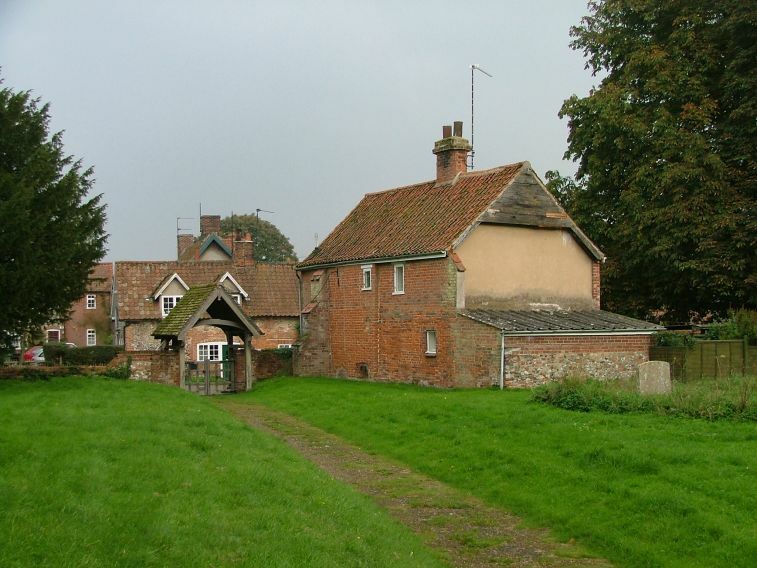 I like Norfolk best off of the main road, when you travel along narrow, winding lanes to the surprise of a proper village, the church in a sweetly overgrown graveyard at its heart, some ordinary cottages, a small green with a village sign, a big house perhaps. This describes Rougham exactly. 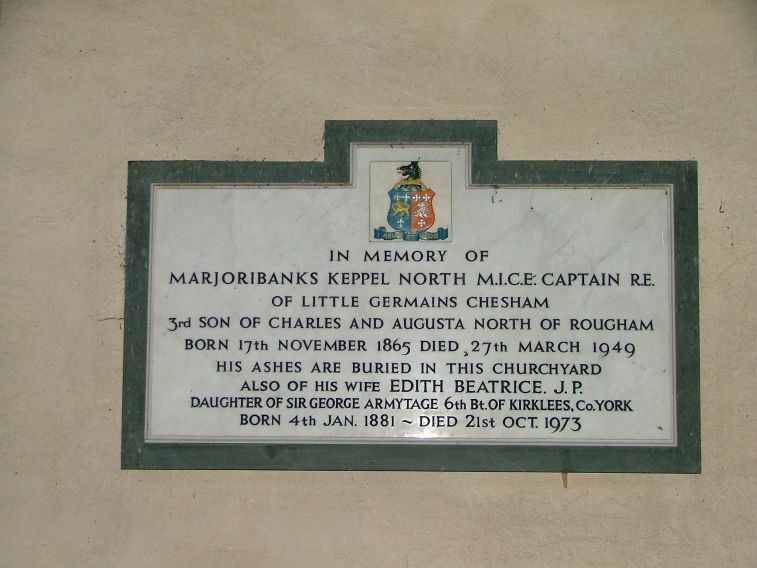 There is even one of those old fashioned road signs with a triangle on top, so rarely found nowadays; perhaps the planners in County Hall have forgotten about Rougham. 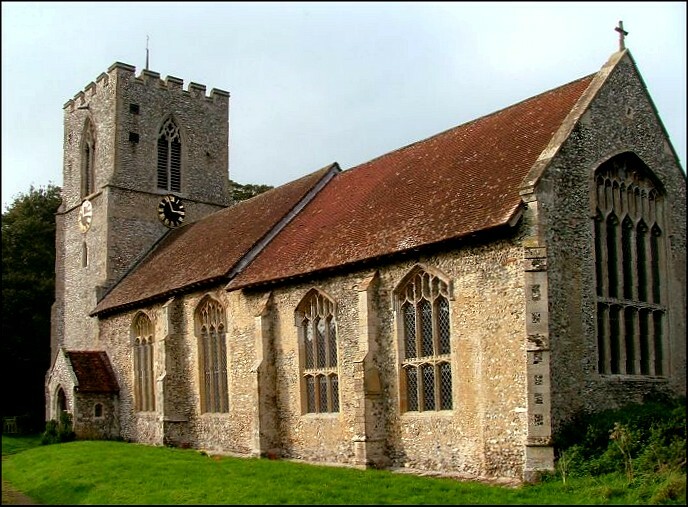 Seen from the south, St Mary appears a typical, small village church, the walls leaning slightly outwards. 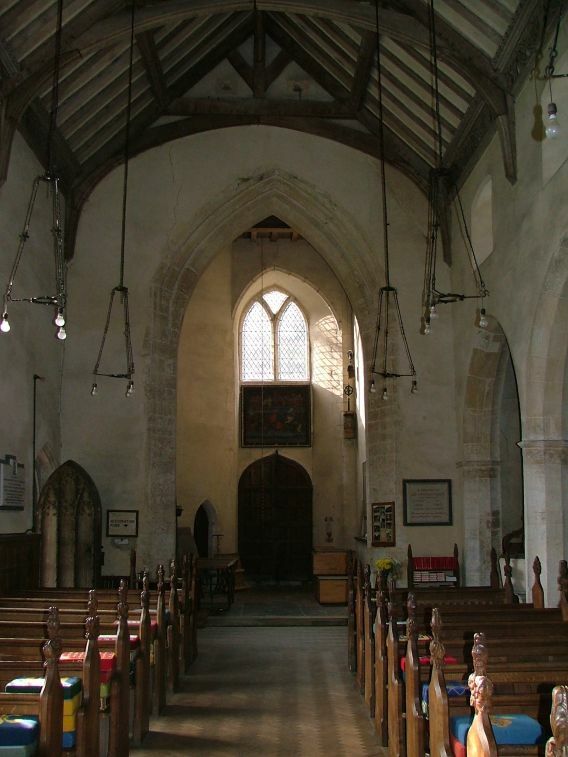 But coming around to the north side you see that here there is a clerestory and a long, low north aisle stretching the length of the building. 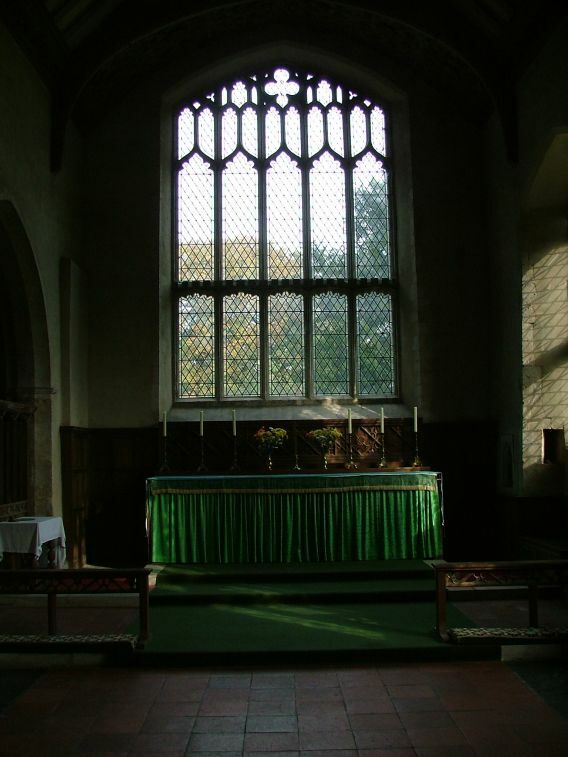 Looking at the south side again, it appears so small that it is hard to see how they fitted a clerestory in on the other side. 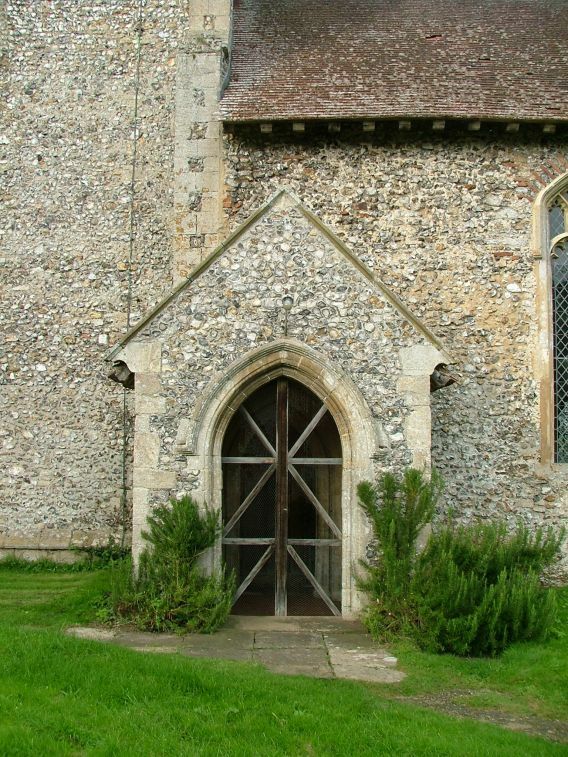 It is as if they are two halves of different churches. 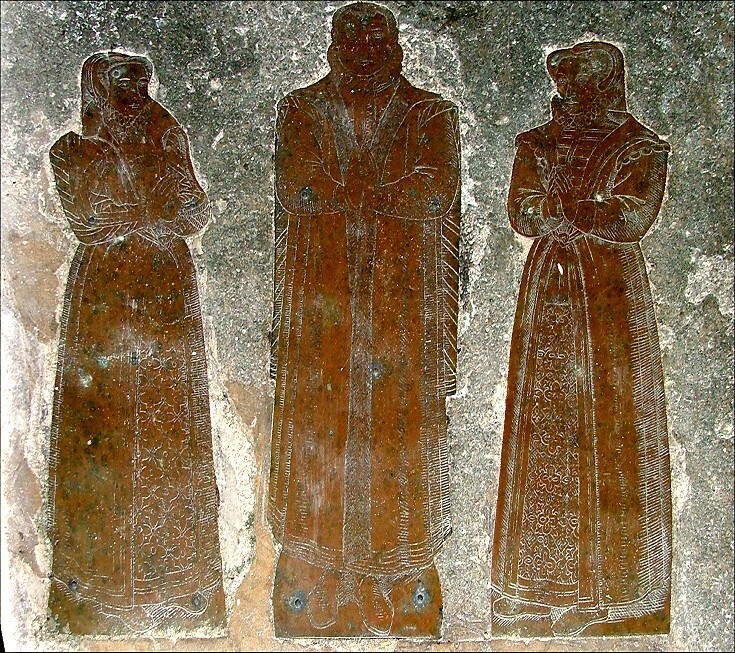 The honeyed stone of the south aisle is very attractive, but the north aisle is rather dour, and there is a reason for this. 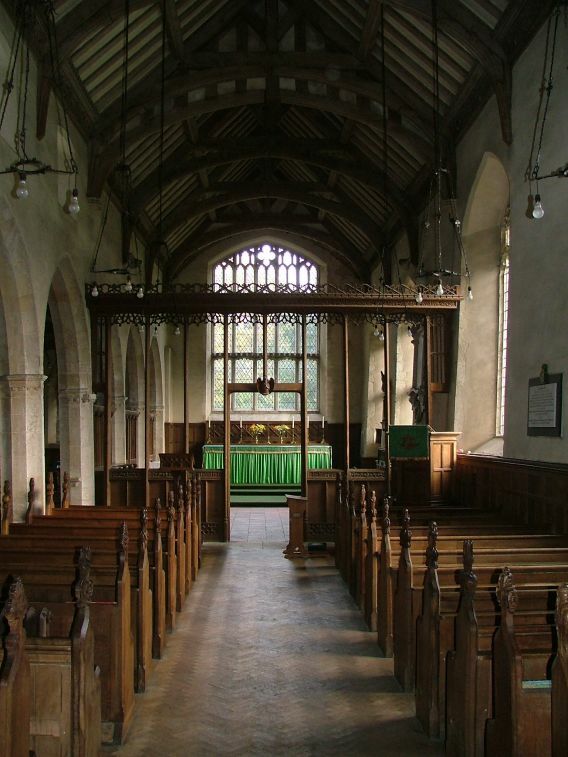 The original aisle was lost in the late 17th century, and was replaced on the eve of the First World War by Sir Charles Nicholson at the fabulous cost of £13,000, well over a million in today's money. As you dot from one side to the other you will pass another rare treasure, and one that is surprisingly little known. 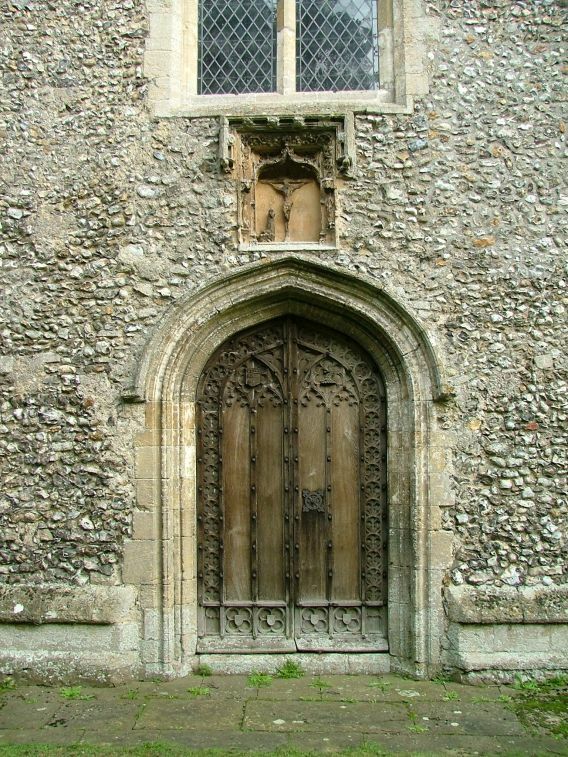 This is a rood group in an ornate niche above the west door. 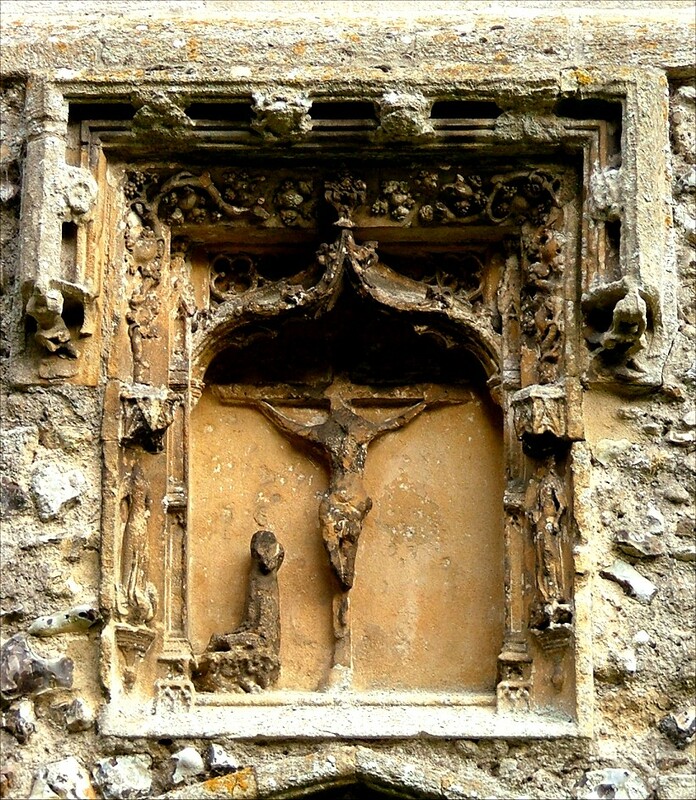 It probably dates from the early part of the 14th century, and the astonishing thing about it is that the figure of Mary survives at the foot of the cross. 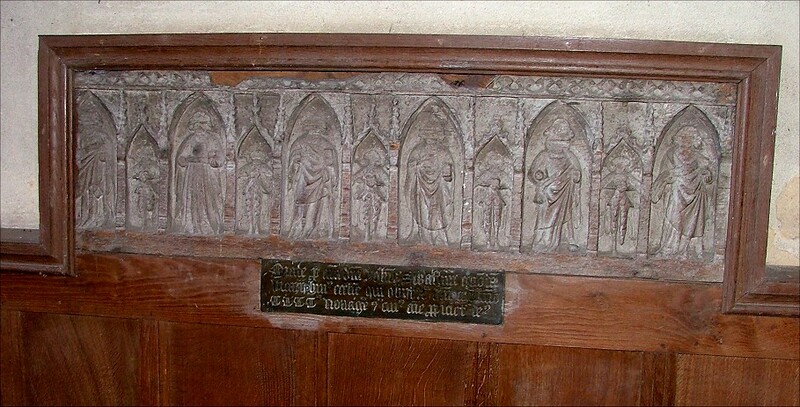 The figure of St John has been completely erased. 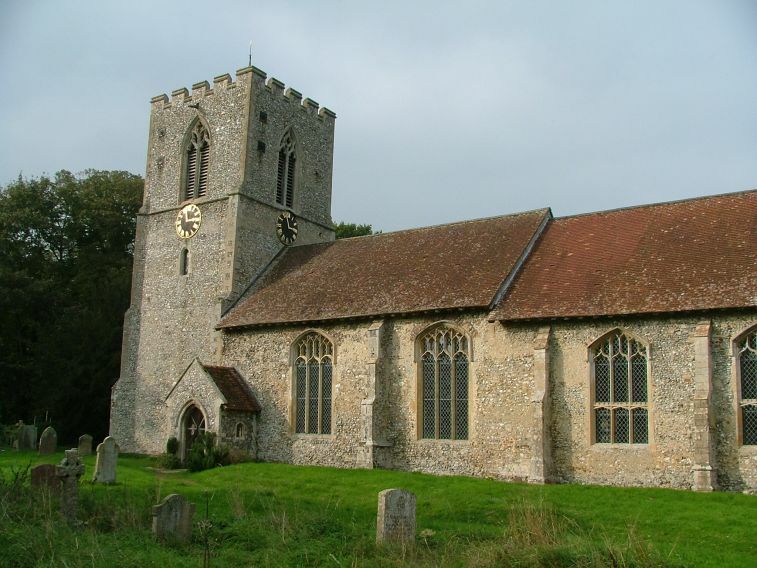 We'd come here towards the end of a day visiting some fairly quirky churches, but St Mary was probably the quirkiest. 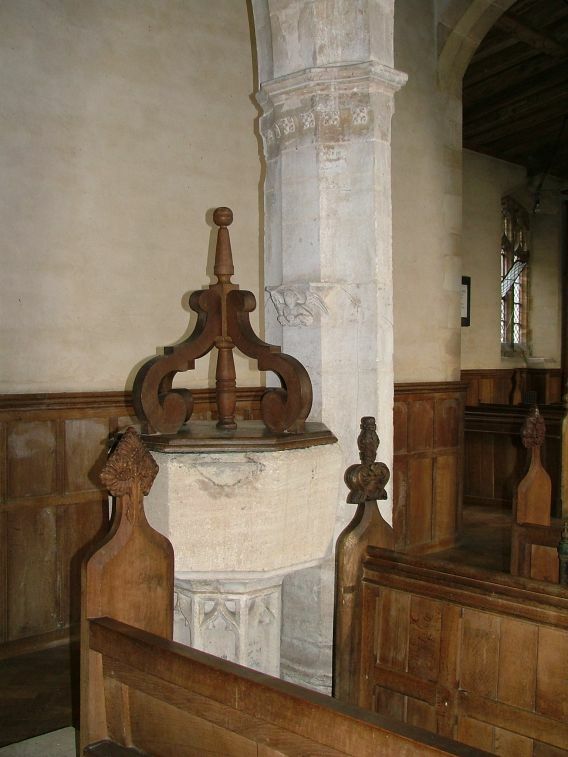 The late date of the restoration is the main reason for this, and also the unusual interior arrangement. 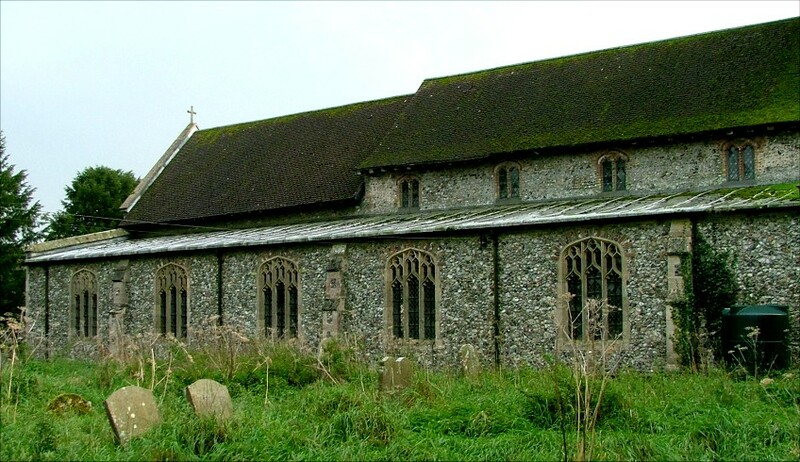 Nicholson put a large vestry and meeting room in the most westerly bays of the north aisle, and so you step into a church which appears narrow, but which then opens up outwards as you head east, when most medieval churches are narrowing. The screen and benches are Nicholson's too, and are good of their date. 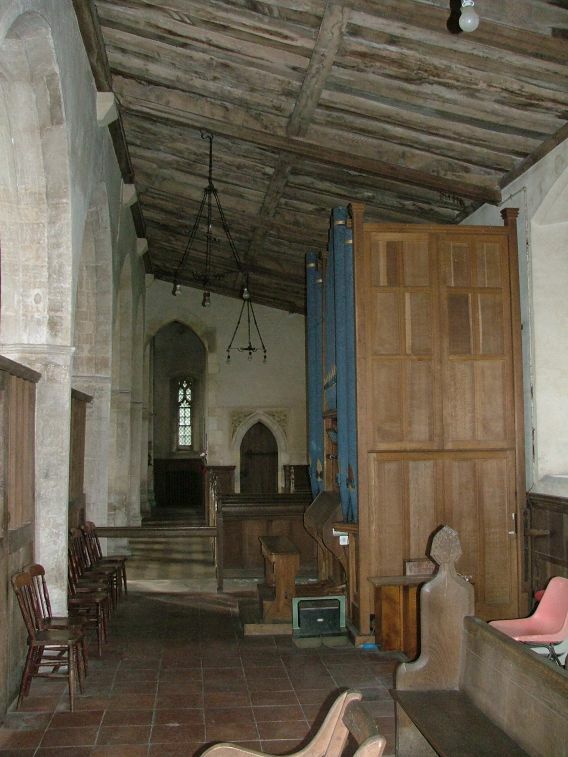 The screen runs across the church and then eastwards, separating off the north chancel aisle and turning it into a long, narrow space, almost a corridor, while it makes of the chancel a square space. Only one bay of the arcade is open between the vestry and the screen, and it is as if you are in a building with separate rooms. This is much more effective than it sounds, not least because of the arcade itself. 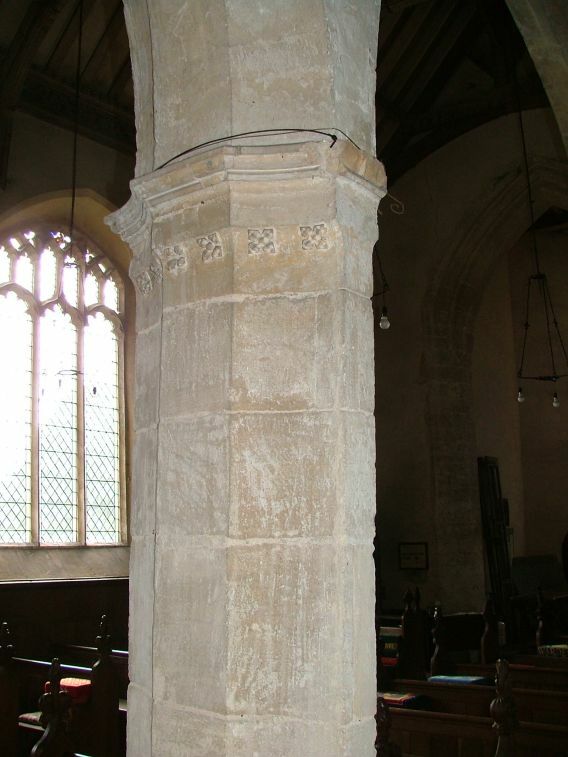 This is very late, probably early 16th century, and the pillars are octagonal with scalloped faces, wide on the north/south axis, but narrow on the east/west. Their elegance is enhanced by the fleurons below the delicate capital. I don't recall seeing anything like this elsewhere in Norfolk. 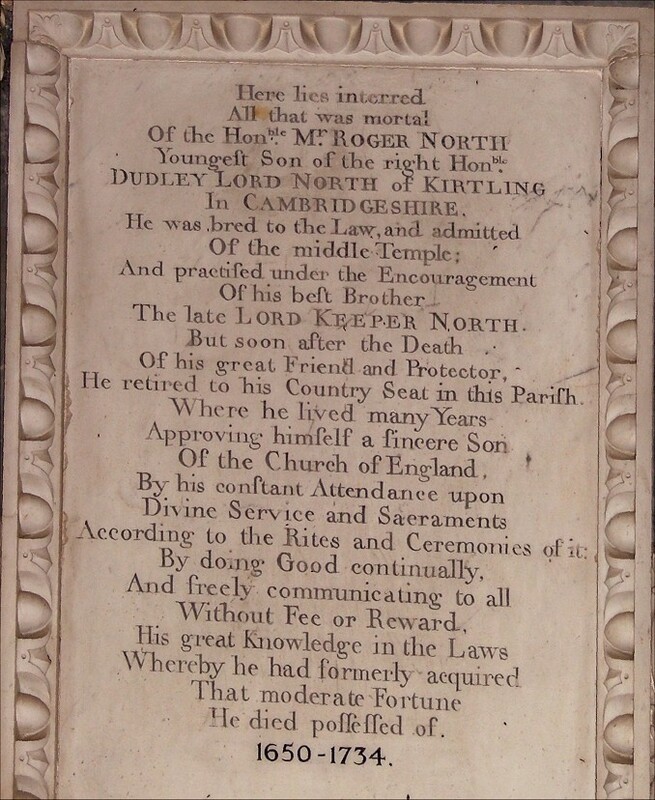 A number of fine memorials line the walls, mostly to the North family. 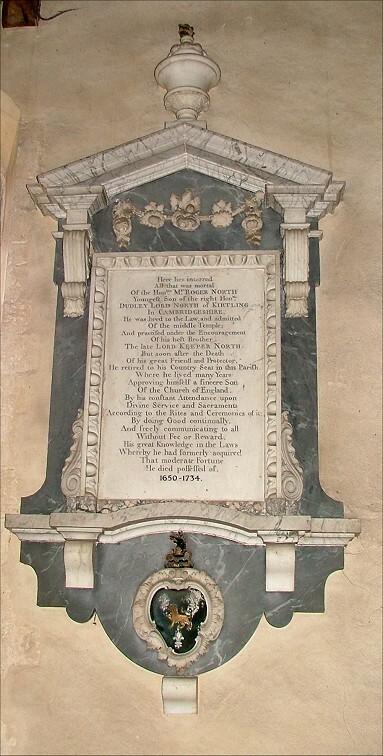 Roger North was a prominent English barrister in the heady years of the Restoration and the Revolution, and his memorial records that he retired to his Country Seat in this Parish, where he lived many years approving himself a sincere son of the Church of England. 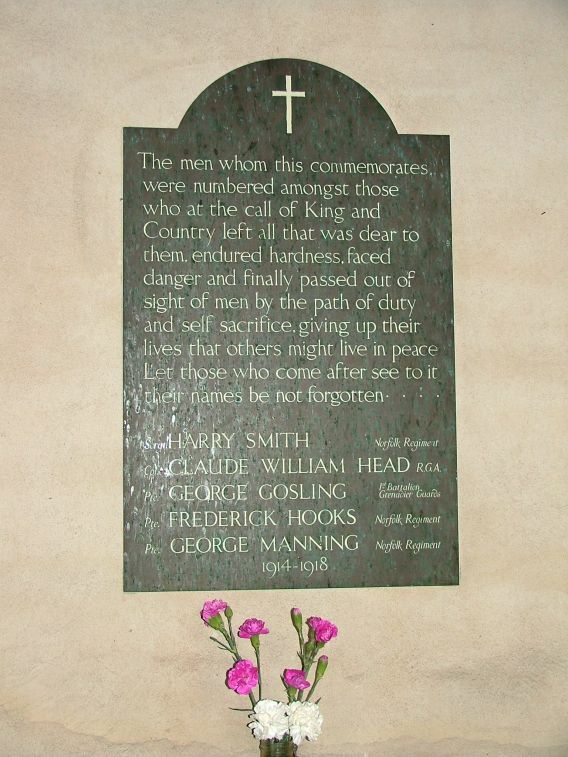 By his constant attendance upon Divine Service and Sacraments according to the Rites of it, by doing good continually, and freeliy communicating to all without Fee or Reward his great Knowledge in the Laws whereby he had formerly acquired that moderate fortune he died possessed off. There, an 18th century novel in a nutshell. Perhaps best of all is the lovely, restrained war memorial, which invests the remembered with a timeless dignity, a rare example where reflection outweighs triumphalism. 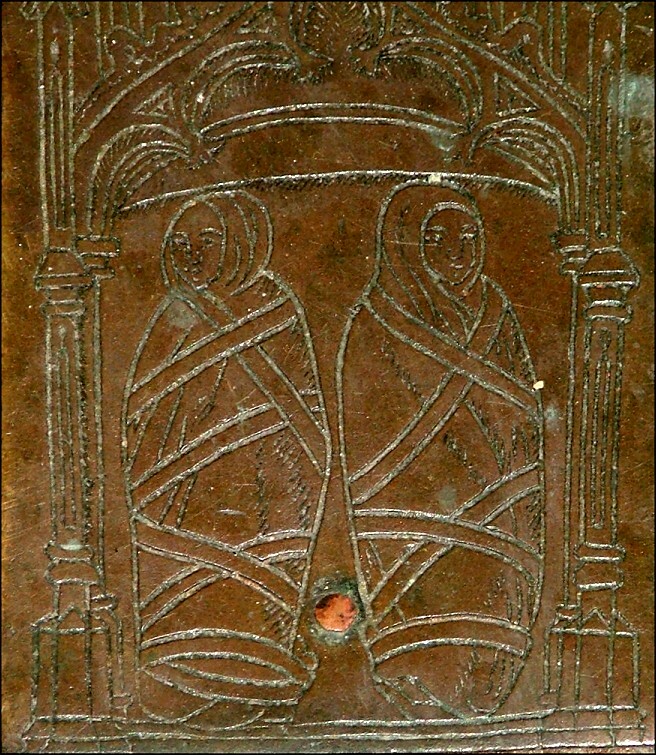 St Mary is a treasure house of brasses, mostly to the Yelverton family. 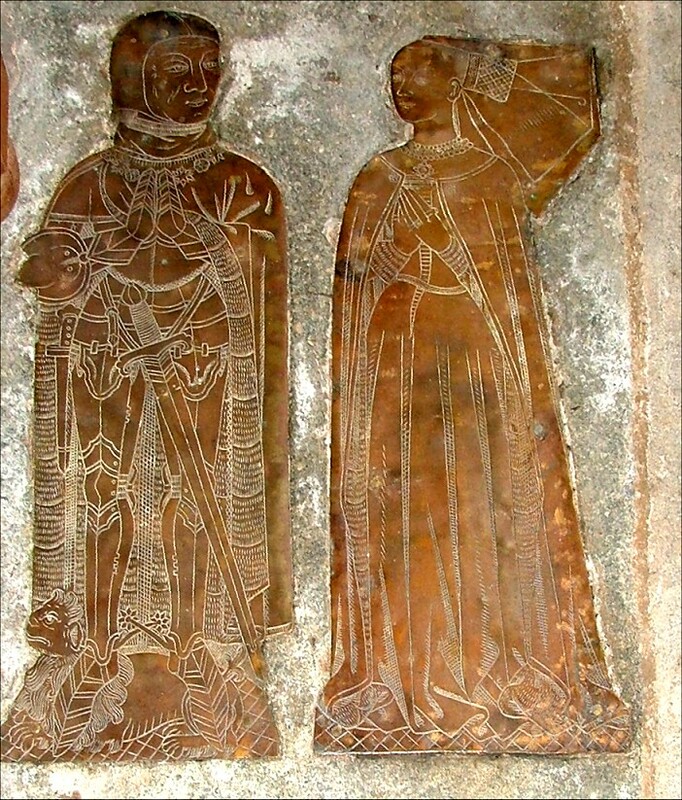 The best of these are the 1470s brass of Sir William Yelverton and his wife, she in a fine butterfly headress, and another Sir William from a century later with both his wives (although not at the same time, of course) and an enormous number of children attendant on them. 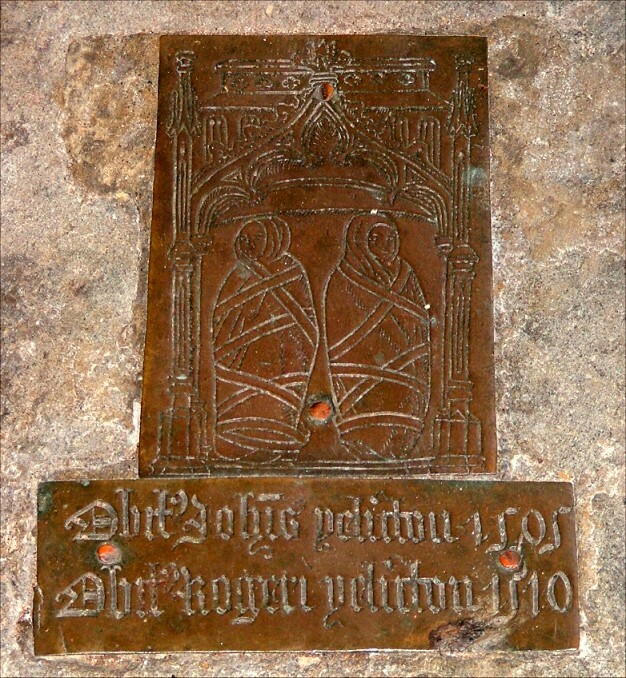 Having said that, the most interesting and moving brass is a little plaque depicting two dead babies in their chrysom cloths, and the simple inscription telling us that John Yelverton died in 1505, Roger Yelverton in 1510. 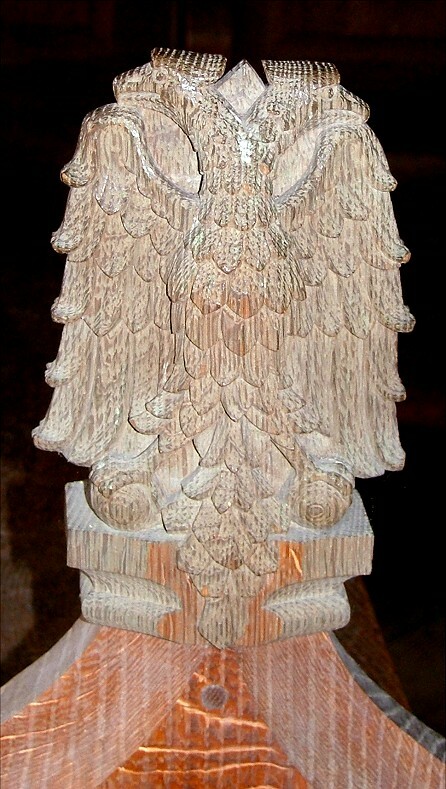 The Royal Arms, like most, have been touched up over the years. 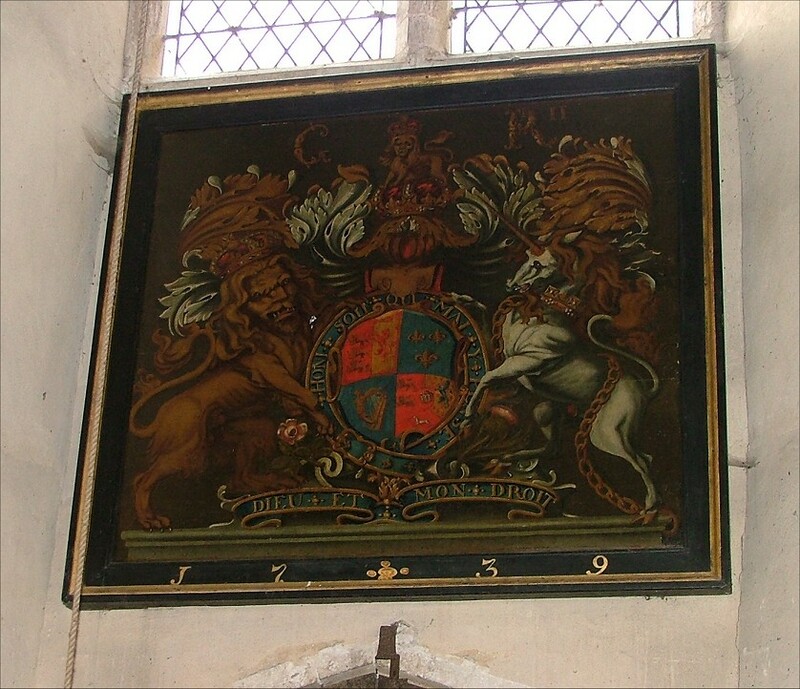 These have been charged with the Hanoverian shield, dated 1739 and altered to read GR II, that is to say George II. 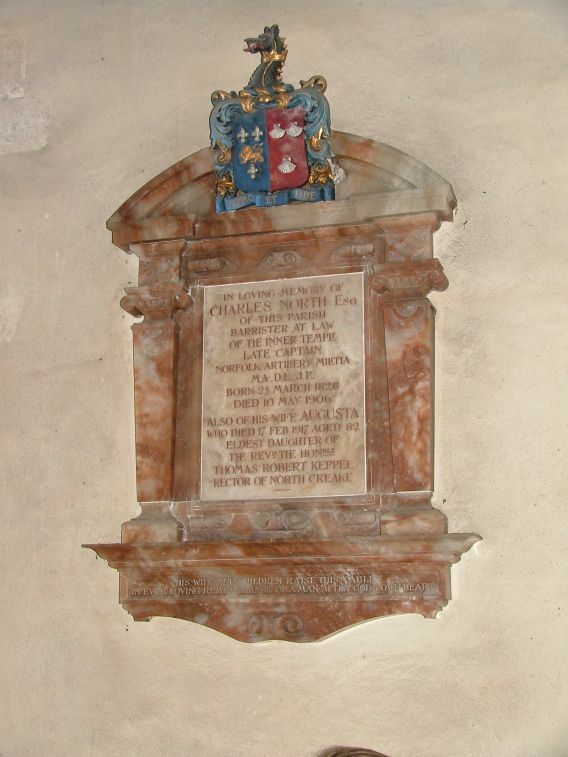 However, the floriated lettering suggests that this was originally the arms of Charles I. 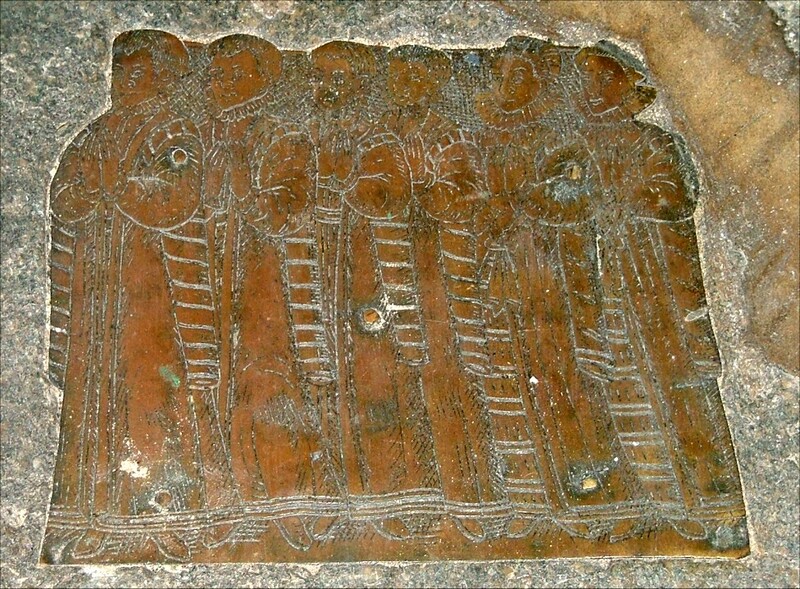 A curious medieval survival is a 14th century frieze of Saints under arches reset in a frame on the south chancel wall. 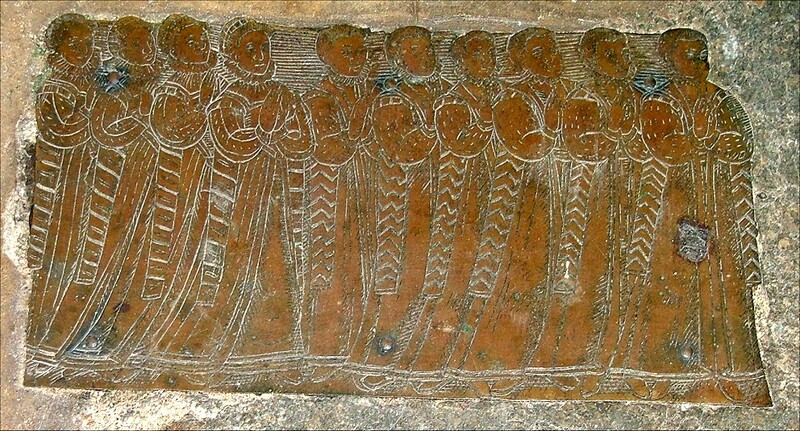 It looks as if it might once have been part of an altar piece, and was probably collected, either by Nicholson or some 19th century antiquarian. 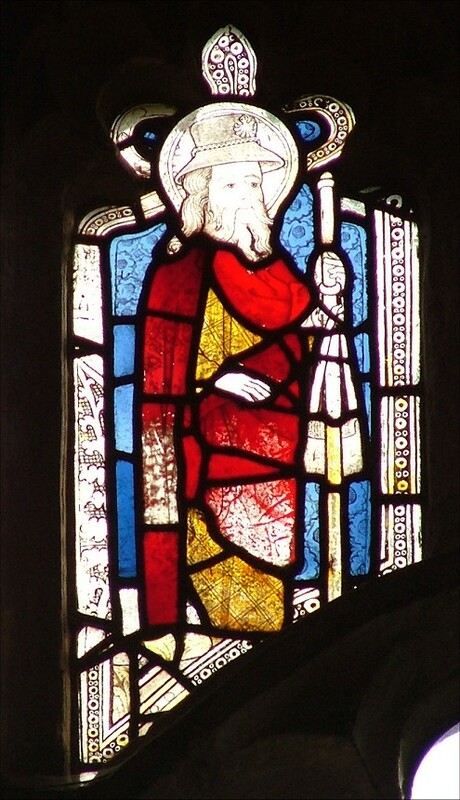 Survivals that probably did come from Rougham are two exceptionally good Saints in 15th century stained glass in the south side of the nave. 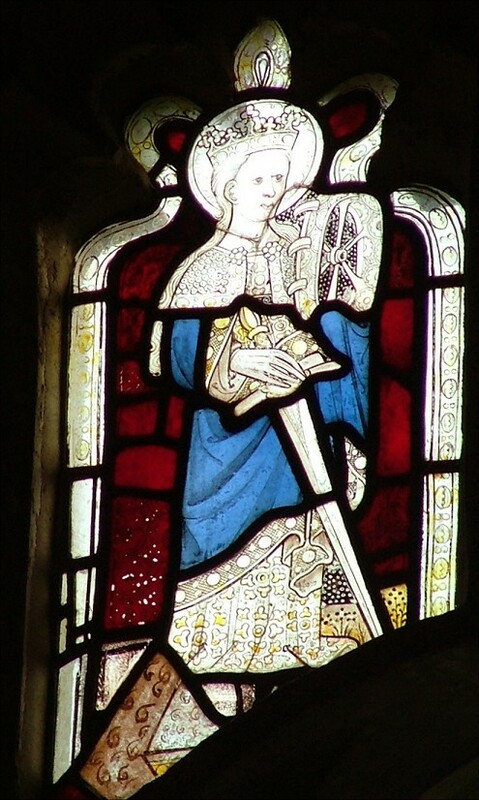 They depict St James and St Catherine, and make you mourn for what must have been lost. Two quirky survivals to finish with. 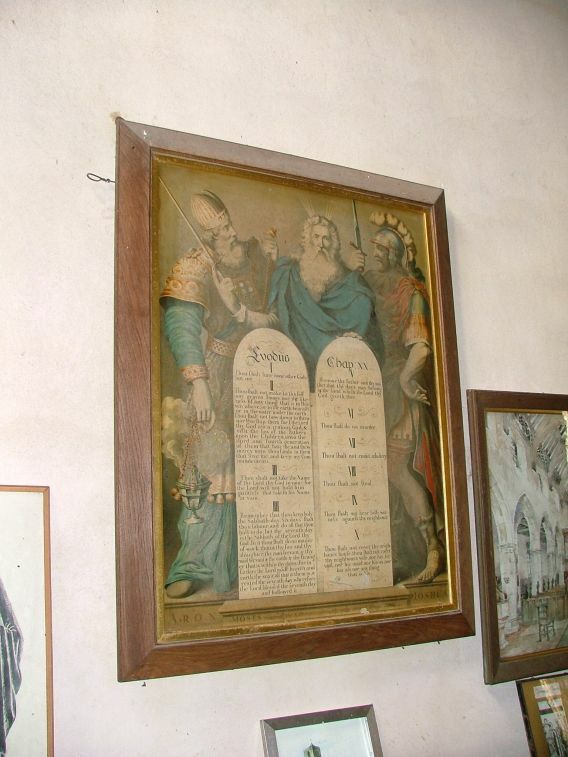 Rougham retains one of those hand-coloured, printed commandment boards feauturing Moses, Aaron and Joshua. These used to be common, but Cautley saw them gradually disappearing in the early years of the 20th century. 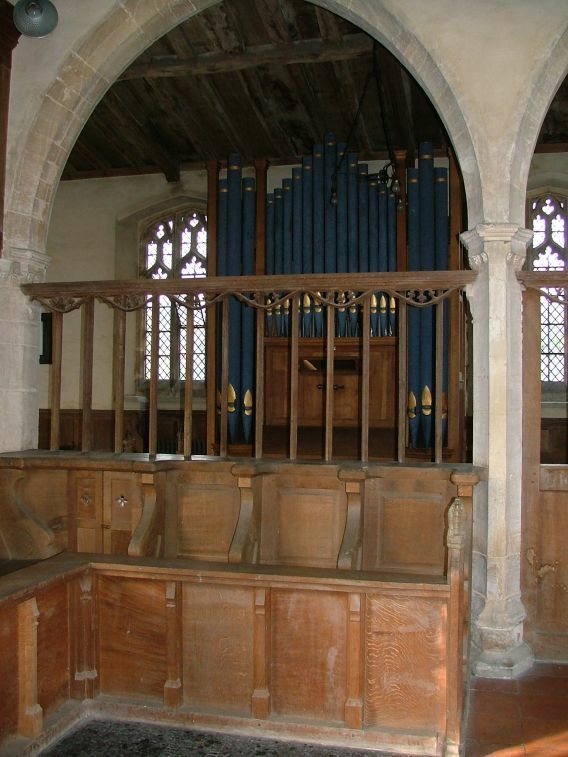 There are probably less than half a dozen of them left in Norfolk churches now. 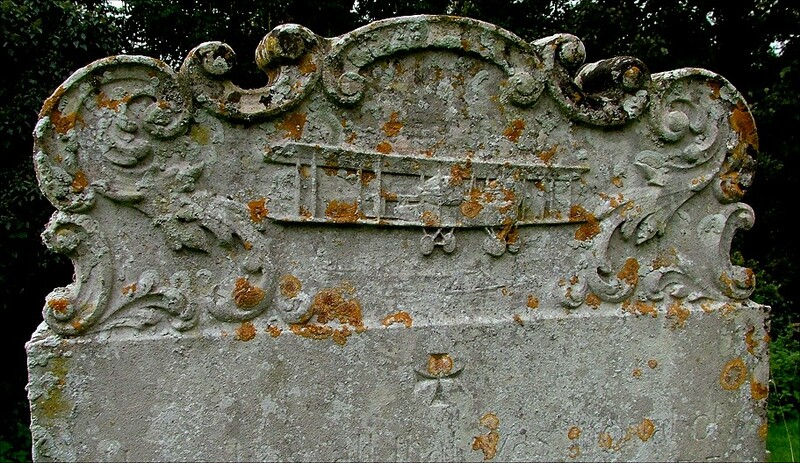 And outside, the gravestone to Thomas Kepple North, who died in 1919. It features, of all things, a biplane. This is because North designed the first aeroplane to make an Atlantic crossing.